In 2004, the Ottawa-based Micronutrient Initiative invited P&LA to advise on a communications strategy to raise awareness of one of the world’s most neglected problems. ‘Micronutrient deficiency’ sounds like an obscure, medical issue. But the lack of small amounts of vitamins and minerals in the human diet was, at the time, one of the world’s biggest causes of child death and the most important cause of mental impairment and of problems in pregnancy and childbirth (causing 250,000 serious birth defects and the deaths of approximately 50,000 young women every year). Initially, the Micronutrient Initiative had in mind a global overview of the micronutrient problem and the research and writing of the Global Report on Vitamin and Mineral Deficiency was completed by P&LA in 2005. 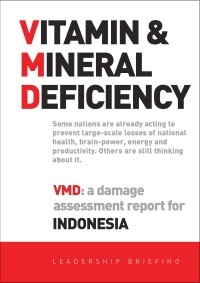 At the same time, P&LA developed a series of individual Damage Assessment Reports detailing the consequences of vitamin and mineral deficiency in each of 88 affected countries. These four-page, read-in-two-minutes, flyers were distributed in different language versions to governments, media and NGOs in all the countries concerned. An example of an individual Damage Assessment Report is shown on the right (click for PDF). Each Damage Assessment Report also summarised the low-cost solutions available and reported briefly on what preventive action had – and had not – been taken by the country. In support of this effort, two other reports were also produced and distributed. A Challenge to Media Professionals – setting out why and how the print and broadcast media in each country could investigate the damage being done report report on whether low-cost steps were being taken to prevent it. A Challenge to the World’s Food Companies – setting out how major food companies could help. Thanks to the effort of the Micronutrient Initiative, UNICEF and other organisations, rapid progress has been made in recent years against the devastation caused by mineral and vitamin deficiency. Today, the great majority of countries have sustained Vitamin A supplementation programmes and have legislated for the iodisation of all salt. 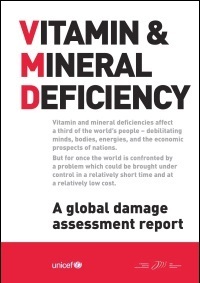 One of the 88 individual country 'Damage Assessment Reports' produced by P&LA in support of the global effort against vitamin and mineral deficiency. The Global Damage Assessment flyer produced by P&LA and launched to the world's media at the 2005 World Economic Summit in Davos, Switzerland.